existed in Indonesia for decades. In many kinds of literature, the term paratransit refers to informal public transport services that are operating without appropriate licenses or permits to provide collective ride services to the public or registration papers from public authorities. They are usually minibuses, vans, taxis, station wagons, three-wheelers, and motorcycles that are operating illicitly. 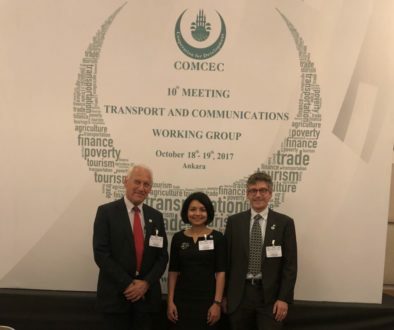 However, this does not mean that they are always operating illegally, as in many countries, the entry to the public transport sector is effectively free, with operators subject only to the general rules of the road and the law of the land. Ojek in Indonesia is a paratransit mode that uses a motorcycle. The price for a journey depends on the distance. A negotiation usually takes place before both driver and passenger agree on the price. Ojek has been very popular, not only among those who do not own private vehicles, but also those who do. The characteristic of a motorcycle that is easy to maneuver through congested roads is the main reason. 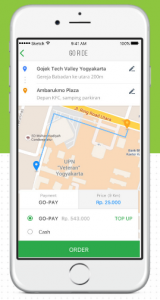 GO-JEK, which has been in operation since 2010 and currently serves 10 big cities in Indonesia, has changed the Ojek system into a more professional service. It is more or less like Uber, which provides an app-based booking system. Currently, GO-JEK not only provides motorcycle-Ojek service, but it also provides many other services such as GO-CAR (using a car instead of motorcycle), GO-FOOD (GO-JEK motor drivers deliver the food you order from any restaurant) and GO-SEND (GO-JEK motor drivers deliver the package you need to send to other places in the city). There are dozens of other services available like massage and beauty service at home, home cleaning service, and ticket delivery service. 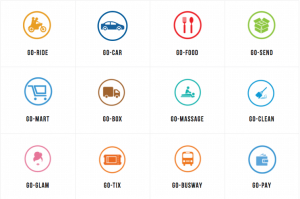 Easy booking system through an app, which is not the case with the traditional Ojek and taxi. Unlike Uber, the journey price of GO-JEK is already known during the booking. And unlike the traditional Ojek, no price negotiation is needed. GO-JEK price is also cheaper than Ojek and taxi. A driver will normally be found within no time and arrive within a couple of minutes, unlike the traditional Ojek where the drivers have fixed places to wait for passengers. Driver’s details, including his/her picture, are shown during the booking, which gives a sense of security to the passengers. When we discuss the existence of paratransit, we cannot deny that it mostly emerges in countries with a poor public transport system. Its shares generally rise as per capita incomes fall. In Africa, for example, it is the dominant mode of public transport for the poor. In Asia, it complements the formal sector, providing differentiated services in identified niche markets as it responds quickly to shifting market demands resulting from rapid urbanization. 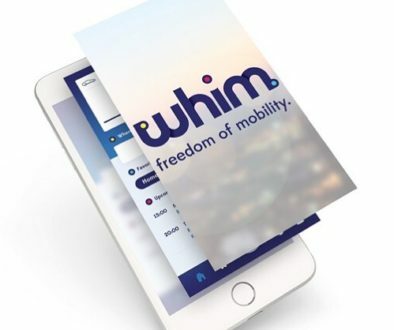 It offers high levels of responsiveness to customers’ needs by providing access to poor areas, direct routing, speed, and flexibility of service against the fixed route gridlocked formal public transport system. Paratransit is also an important entry point to urban employment. In the case of GO-JEK, it has seen an income increase of hundreds of thousands of its drivers. However, the paratransit sector is often seen as a nuisance by national and municipal transport authorities as it can cause significant problems in urban environments due to its negative characteristics of informal transport, such as dangerous on-road behavior of the drivers, the pollution and congestion caused by the vehicles, and the fact that they undermine the formal services. In my professional opinion, the paratransit sector can substitute the failed formal public transport provision without the need for subsidies. The investment to organize this type of public transport lies completely in the private sector. These should be considered as positive points. What the authorities should do is to identify a regulatory and administrative framework within which the potential of this sector can be mobilized and developed. Don’t miss the latest news on how the world is keeping up with the transition to a sustainable mobility system. Through our newsletter, we will share news updates, our projects and perspective on this issue around the globe. Sign up now and receive a must-read 10-page ebook about “Urban Transport Trends in World's Megacities”. 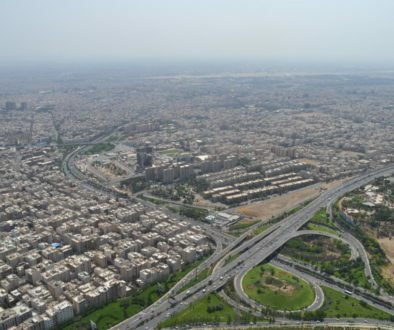 In this special edition, we highlight the latest global transport trends in megacities.